CAISO said Monday its Western Energy Imbalance Market has produced more than a half-billion dollars in benefits for participants since its founding five years ago, including more than $100 million in benefits in the third quarter of 2018. Those third-quarter benefits, driven by high demand and fuel costs in July and August, were the most for any quarter since CAISO started the EIM in November 2014, the ISO said. In Q3, the EIM produced $100.58 million in savings, with its total benefits reaching $502.31 million, it said. “This clearly illustrates the value of markets to the customers in California and the region,” Steve Berberich, CAISO’s president and CEO, said in a statement. 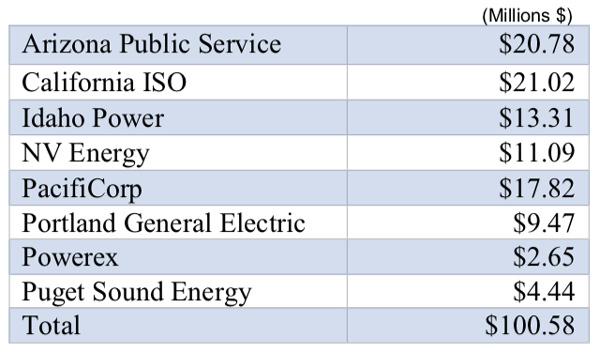 CAISO and Arizona Public Service (APS) claimed the largest share of third-quarter benefits ($21.02 million and $20.78 million, respectively), followed by PacifiCorp ($17.82 million), Idaho Power ($13.31 million), NV Energy ($11.09 million), Portland General Electric ($9.47 million), Puget Sound Energy ($4.44 million) and Powerex ($2.65 million). CAISO was by far the biggest net importer of energy during the quarter at nearly 1.336 million MWh, with NV Energy a distant second at 285,971 MWh. By comparison, CAISO’s net imports were just 355,549 MWh during the second quarter, while net exports surged above 1.9 million MWh in the face of solar surpluses. The EIM real-time wholesale market allows CAISO and non-ISO participants to trade energy across the West, often reducing costs and curtailment of renewable resources including solar, wind and hydroelectric power. Many industry leaders have praised its benefits, including those who oppose the idea of a Western RTO led by CAISO. (See Overheard at Transmission Summit West.) Unlike an RTO, the EIM’s transmission-owning entities retain operational control over their assets, while member generators participate in the real-time market on a voluntary basis. Meanwhile the EIM has been expanding, increasing its reported benefits. Notably, Idaho Power and Powerex began transacting in the market in April, bringing to eight the number of members participating in the EIM. (See .) That expansion equipped the EIM to serve imbalances for about 55% of load in the Western Interconnection, according to the ISO. 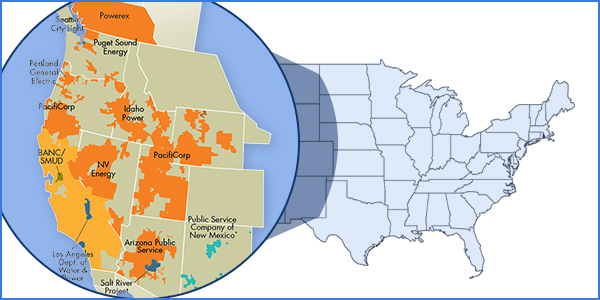 Market participants serve more than 42 million customers in an area that stretches from Canada to the Mexican border, including large swaths of Arizona, California, Idaho, Nevada, Oregon, Utah, Washington and Wyoming. NV Energy, APS, PacifiCorp, Puget Sound Energy and Portland General Electric are already participants. Five more entities are slated to join the EIM in the next two years. 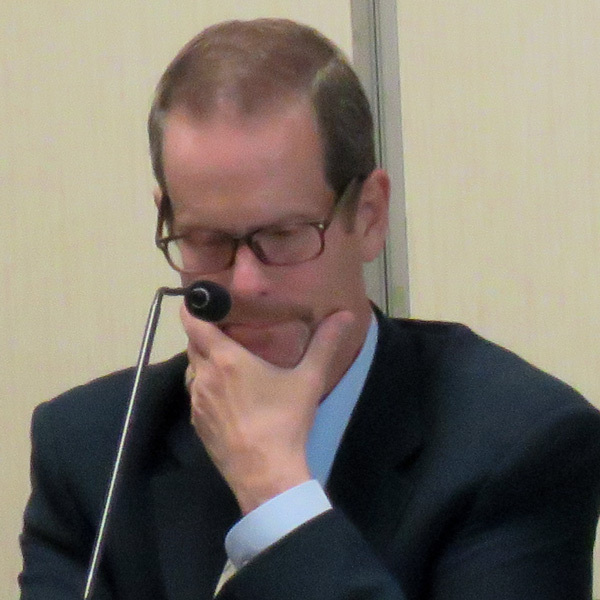 The Balancing Authority of Northern California and the Sacramento Municipal Utility District plan to begin participating in April 2019. The Los Angeles Department of Water and Power, Arizona’s Salt River Project and Seattle City Light are scheduled to begin participating in April 2020. The Bonneville Power Administration has been discussing joining the EIM, most recently in a stakeholder call on Oct. 11. BPA would likely bring its “big-ten” resources to the EIM, officials said on that call, including the Grand Coulee, Chief Joseph and The Dalles hydroelectric projects on the Columbia River. The Columbia basin covers an area roughly the size of France, they noted. Officials on the call said the BPA could sign an agreement with the EIM as early as the end of 2019.